Printing Method: ZINK - "Zero Ink"
The pocket-friendly printer that travels with you, wherever you go. 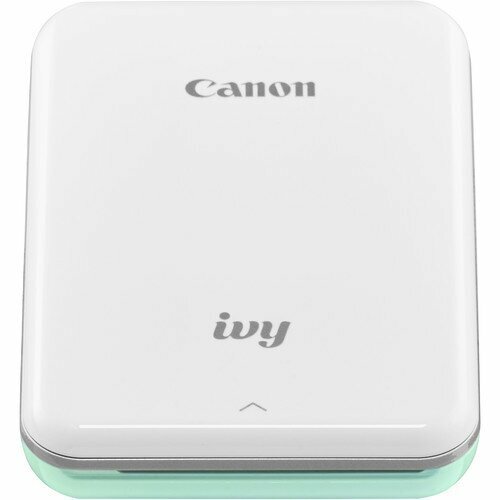 With the Canon IVY Mini Photo Printer, print peel-and-stick 2" x 3" photos from your smartphone or favorite social media1 platform to share with your friends and family. You can even customize your photos before you print them by adding frames, emojis, stickers, filters, text, tile print, collage print and more! Keep the good times rolling and print your favorite Instagram-worthy snapshots directly from your smartphone. The Canon IVY Mini Photo Printer is small enough to fit in your pocket so you can take it just about anywhere! Ultra-portable — about the size of a cell phone — this printer can easily go wherever you go. Add stickers, frames, text and emojis — plus, use the drawing tool to add your own doodles and sketches. The Canon Mini Print App even includes AR live filters that transform your photos using face tracking technology. From birthdays and special occasions to nights on the town, print 2" x 3" photos that are smudge-proof, tear-free and water-resistant, with a peel-and-stick backing that adheres to your favorite surfaces. Connect your IVY Mini Photo Printer to the USB cord and hang tight until the light changes from red to green. Once fully charged, power up by holding the button and wait for the white light to turn on. Open the printer’s lid by gently pressing down and pushing back on the ⌃ symbol. Place the blue SMART SHEET in the tray first, followed by the ZINK Photo Paper, making sure all barcodes and logos are facing down. Sync your IVY Mini Photo Printer with your smartphone by heading over to your Bluetooth settings and selecting ON. Open the Canon Mini Print App and tap to add your printer. You’ll only need to do this once per device. That's it! It's time to start printing!